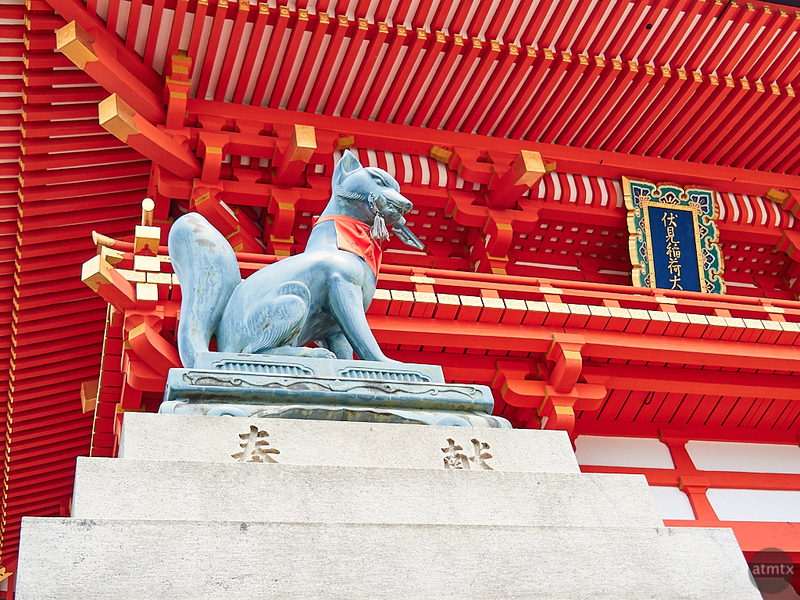 Here’s day two’s details from Fushini Inari-taisha, a Shrine in Kyoto, Japan. On display today, a fox, or Kitsune in Japanese, with a key in its mouth. Kitsunes are common at Inari Shrines and are considered messengers. The key, in the mouth, is for the rice granary. I’m no expert in the Shinto religion, this information is courtesy of Wikipedia. I like gray color contrast to the striking vermillion and the statue’s shape to the pattern of the background. I often select my compositions visually. During my travels, I’m drawn to the way things look rather than knowing any deep history about a place. I do however, learn interesting new facts, when I do the research while putting together these posts. Observant viewers might recognize this structure as the same one shown yesterday. I just zoomed in on a different detail, courtesy of the 14-150mm Olympus travel lens. This one’s at a 44mm equivalent, which is pretty much a normal view, neither a wide-angle nor telephoto.